Many travelers have heard about Raja Ampat Regency. However, it is only a part of West Papua Province, which means other options are available. For instance, there is Kaimana Regency. Despite inferior fame to Raja Ampat, it offers stunning natural attractions to visitors. One of them is called KM 14 Nature Park. It is a recommended tourist spot for relaxation and getting closer to nature. Some people even come to the location to eradicate stresses, take a bath, and play some water sports. Not to mention it is possible to go fishing! 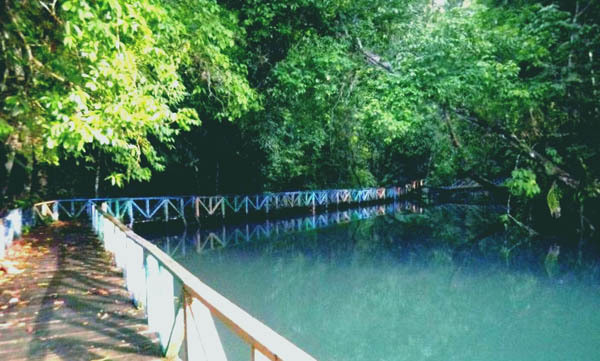 As the name cited, the nature park offers a pristine environment with lush trees and a beautiful pond. The trees are tall and the bushes are dense, which create a comfy and peaceful nuance. There is even a bridge, built on the small river. It becomes tourists’ favorite place to enjoy the scenery and go fishing, after all. Near to the bridge, some gazebos reside beautifully, on which people can relax on. In such small forest, visitors can even find public toilets. That means they can spend hours in the nature park without worrying about bladder issues. Once tourists get to the nature park, they might see a flawless river. The size is not quite big, but it is surrounded by beautiful gazebos and a wooden bridge. No wonder, many families come to the location for a picnic. The locals call the gazebos as “honai”, actually. Despite high traffic of tourists, the nature park remains neat and clean. Thanks to a good management and visitors’ awareness regarding the environment. No trash is seen in the area. What a pure and beautiful nature park! It is safe to say KM 14 Nature Park is a miniature of Amazon! The most popular activity is to get in the wooden bridge and witness beautiful scenery from there. The problem is the surface of the bridge is a little bit slippery, especially during rainy season. It is worth an effort, though. The views are somewhat different to that of the big cities. Thus, visitors would be satisfied by its mesmerizing and pure landscape. Even a peaceful atmosphere is quite calming. This explains why most of the visitors come to the location for relaxation and finding peace. They want to get away from a busy city life, after all. Photography is also popular in the nature park, as many types of fishes and birds live nearby. Taking some pictures of the environment and people is also a good idea. Regardless of activities, KM 14 Nature Park provides refreshing air and flawless environment to tourists. This would entice both domestic and foreign travelers, for sure. What’s next? At the end of the adventure, tourists can drop by in Kaimana Regent’s House for witnessing stunning sunset! The fact is that KM 14 Nature Park belongs to Kaimana Regency. It is not difficult to reach the location, as it is situated near to the main road. However, outsiders should head to Utarom Airport first by airplane. Once they reach Kaimana, they can take a local transportation service to the location.